Happy birthday Lynn Cherry (The Great Kapok Tree) and Betsy Maestro (How Do Apples Grow?, Why Do Leaves Change Color?). On this day in 1759, George Washington marries Martha Dandridge Custis. Read George and Martha by James Marshall. In 1781, British naval forces led by Benedict Arnold burn Richmond, Virginia. Read Traitor by Jean Fritz and The Notorious Benedict Arnold by Steve Sheinkin. Construction of the Golden Gate Bridge begins in San Francisco Bay in 1933. Read Pop’s Bridge by Eve Bunting, illustrated by C.F. Payne. Today marks a relatively new holiday on the calendar, National Bird Day–set aside to think about the birds people keep as pets and how owning them affects the bird population on earth. Our attitudes toward animals and birds and how we treat them has changed dramatically over time. 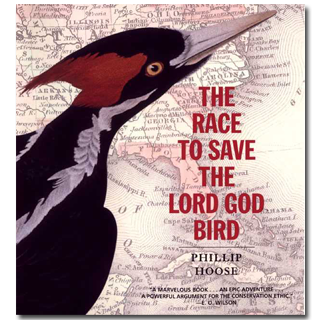 No one has ever captured the changing mores about birds better than Phillip Hoose, in his masterpiece The Race to Save the Lord God Bird. 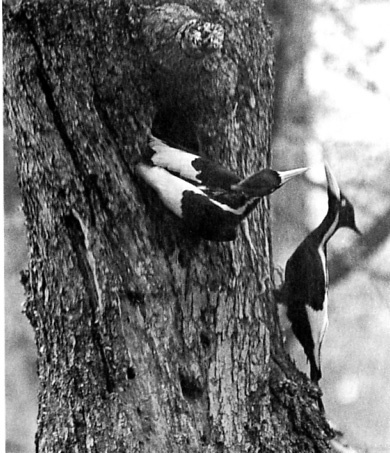 In this intelligent photo-essay for fifth to eighth graders, Hoose focuses on the Ivory-billed Woodpecker, sometimes called the Lord God Bird, “a majestic and formidable species,” and its struggle for survival. In a book that covers two hundred years of bird history, readers first see those bird lovers of the 1800s, who shot, drew, and preserved their specimens. Then Audubon, another hunter, comes on the stage, who records details of his prey through art. Some years later women’s hat fashions devastate the bird population. Everyone wanted a distinctive plume to wear in their chapeau. Consequently, the Audubon Society was created—to try to convince those with a fashion sense to leave out the birds. Hoose moves with grace and dexterity through American history—the need for timber, the shrinking habitat of the Ivory-bill, and the wanton collectors. Hoose weaves the Ivory-bill in and out of his tale during this history, as the bird fights for survival while its habitat shrinks. Eventually the Cornell University ornithology crews head out into the swamps, with video cameras and microphones; a different kind of hunter, seeking a scientific record, they try to capture the sound of these creatures. By this point, anyone reading the book wants one thing—to actually see and hear one of these woodpeckers. How do you make people love something that no longer can be found? That, of course, has been the problem when it comes to all vanished species. If a child has never seen a passenger pigeon, how can he or she care what they were like? But Hoose manages to make readers care in this book. Through The Race to Save the Lord God Bird they can watch others come under the spell of this species and witness these creatures dwindle in number. Shortly after The Race to Save the Lord God Bird appeared in print in 2004, a sighting of the Ivory-bill was reported and made national news. The sighting was never verified; but Phillip has made all his readers hope that some day, one will be seen again. Great for discussion, brilliant in its execution, The Race to Save the Lord God Bird should be read by everyone who loves winged creatures. In the 1980s, bird-watching had become a phenomenally popular activity. Millions of birders took to the field with powerful lightweight binoculars hanging from their necks and color field guides jammed into their pockets. Determined to care for the earth and its creatures, more and more high school students chose careers in biology and conservation. With more biologists, better laws, new conservation groups, and more public support, we began to hear stories of species rescued from the brink of extinction. Originally posted January 5, 2011. Updated for . Gallagher’s book describes the adventure of his expedition to find the Ivory-billed Woodpecker In Arkansas. It’s fast-paced and exciting. I couldn’t put it down. Now I can’t wait to read The Race To Save The Lord God Bird. It sounds like a great children’s version of the story. I was very happy to see *She’s Wearing a Dead Bird on Her Head! * mentioned alongside Hoose’s spectacular work. What a happy pair to think about on National Bird Day! Wow. What an incredible site. I wish I had had a resource like this when I was a teacher/librarian. Every teacher education school needs to know about this site. Also, I think I could live here, just reading book after book, and going off to do further research on the ideas generated here and the other books suggested! Thank you, Anita, for such a well-researched, comprehensive resource. I read this book a few months ago and honestly, I didn’t think I would enjoy it as mush as I did. It is a beautifully told story. I definitely need to read this one! I just finished Kathi Appelt’s wonderful book The True Blue Scouts of Sugar Man Swamp and it also speaks of the Lord God Bird. I am looking forward to reading about this bird that has inspired such reverence and awe. I devoured Hoose’s Moonbird last Christmas and immediately bought The Race to Save the Lord God Bird. Both books are beautifully-crafted and well-researched. I look at the little woodpeckers in my pecan tree more fondly these days. I always use this book as an example of the best narrative nonfiction available. Thank you for the book.